Anyone remmember 'The Friction', Luton band from 1979? Posted: Mon Jun 07, 2004 11:43 am Post subject: I was The Friction! 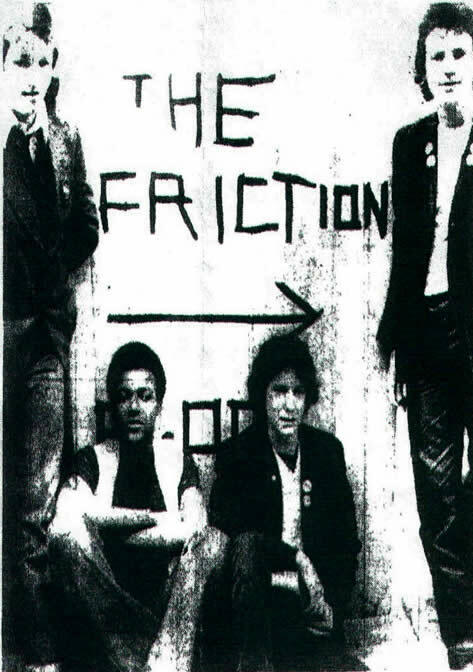 The Friction formed in 1978: Cary Graves (guitar), Roger Holdstock (vocals), Colin Salmon (drums) and Mark White (bass). We organised and debuted at the infamous 1979 Luton Town Hall gig, along with the Statics, UKDKand the Clips. Luton Council immediately banned all 'punk' from its premises! 2nd gig at Richmond Hill School for the Mentally Handicapped for French exchange kids - imagine that if you can. Mark was on holiday so Cary switched to bass and Phil Imber (the Jets) guested on guitar. We played all the usual Luton venues: Baron of Beef, Christchurch, 33 Arts Centre, etc. and recorded "Murder" at Quest Studios (anybody got a copy?????) 25 years ago today! We started to spread our wings and in 1980 played Bossard Hall, Leighton Buzzard (supporting UKDK), and other pubs and clubs in Dunstable and London. Colin and Mark were both squatting in Camden by now and Cary had moved out of Luton, but lost his licence. The Friction fell apart. Cary now lives in the middle of Nowhere, NSW, Australia, Colin in Notting Hill (you will have seen him on tv oin James Bond films), Mark sadly suffered a serious stroke in the far east and is now confined to a wheelchair in a Surrey nursing home, and I do nothing. Posted: Tue Jun 08, 2004 3:15 am Post subject: Hello and welcome Roger..and infamous Town Hall gig! Hello and welcome Roger..and infamous Town Hall gig! 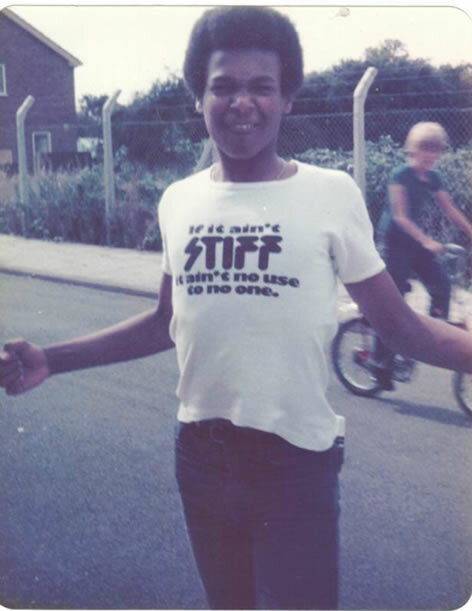 The Friction formed in 1978: Cary Graves (guitar), Roger Holdstock (vocals), Colin Salmon (drums) and Mark White (bass). We organised and debuted at the infamous 1979 Luton Town Hall gig, along with the Statics, UKDKand the Clips. Luton Council immediately banned all 'punk' from its premises! Wellcome Roger..great to see you here! and thanks for filling us in with information on 'The Friction'. we are saddened to hear about Mark, but at least Cary managed an escape-but where exactly is the 'middle of nowhere', in NSW Australia? Colin, well 'will the next James Bond' please stand up! its 'Much respect' to you 'Sir'! We Cant imagine you not doing anything Roger..!! but we know your sense of Humour! Yes found this pic of Luton Town Hall after the 'infamous' punk gig of 1979. 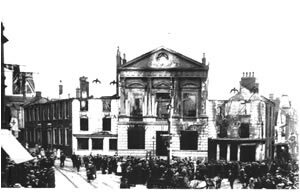 In front of the Town Hall there were 345 firemen and 200 riot squad! Thought it would be nice to post it here! That was the last time that any kind of 'Punk' music, was ever played there! You asked if anyone had a copy of 'Murder' - I still have the pink single that you gave me when it was first pressed. It still has the pink music label with no info as to what's on it. I remember you, The Clips and The Jets - who were the other band? - possibly from Leighton Buzzard? You forgot to mention the 'Radioactive Flourescent Crunchy Frogs' from the Town Hall gig. 'Farewell To The Playground' - with cover photography by Mark White. Rat, the other group was Paranoia, from Dunstable. The Jets were called the Tee Vees on the ep, and released that track as a b-side of a single on Good Vibrations. A-side was "Block 4".